Congratulations, Emma Sharp, on being awarded the David Burch Prize for 2016. Emma’s blurb will be updated soon. Midori HIRAGA is a PhD student for the International Political Economy of Food in the Graduate School of Economics, Kyoto University, Japan. She achieved MSc (Food and Nutrition Policy) from the Centre for Food Policy, City University London, UK. She now researches the international political economy on provisioning vegetable oils for industrial mass diet with the historical case of Japan transforming vegetable oils into everyday foodstuff, as well as researching the developing trajectory and the structure of the global vegetable oil complex. Jenny Kaldor is a PhD candidate at Sydney Law School. Her research focuses on the overlap between food law and public health law, and the potential of food regulation to improve diets at the population level. 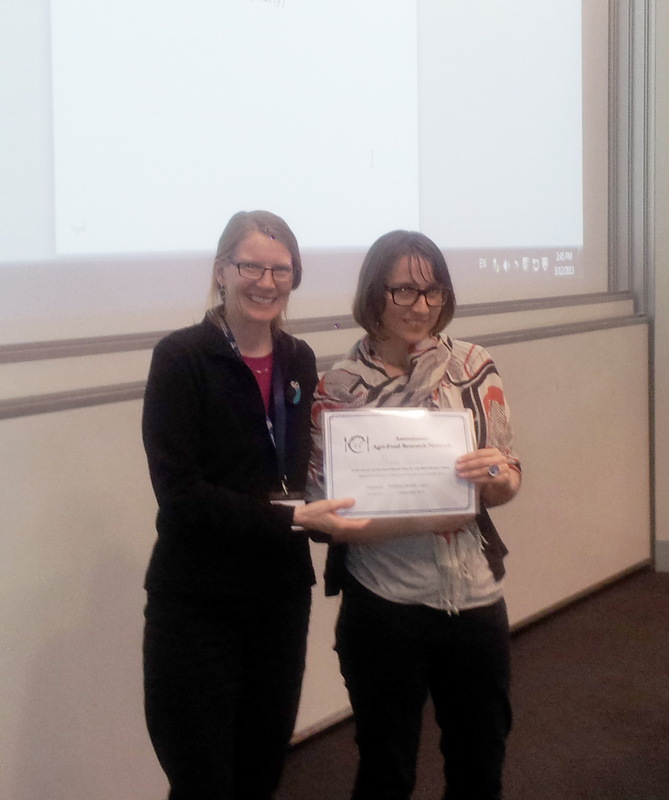 Outgoing AFRN Convener, Carol Richards, presented Jenny with the David Burch Prize for her presentation “Whose security? The contest over food security in Australia’s National Food Plan and Agricultural Competitiveness White Paper”. 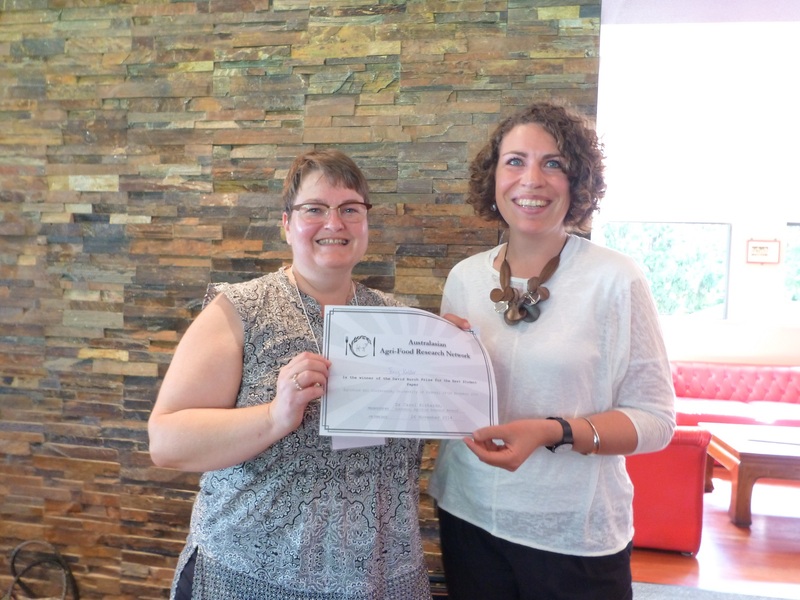 Ms Shona Hawkes, MPhil student from The University of Queensland was awarded the David Burch Prize for Best Student Paper by keynote speaker, Professor Jennifer Clapp, of Waterloo University, Canada. Shona’s paper was on the topic of the financialisation of agriculture and impressed judges by her grasp of complex global political economical issues and innovative presentation using self-designed infographics to explain her research findings. 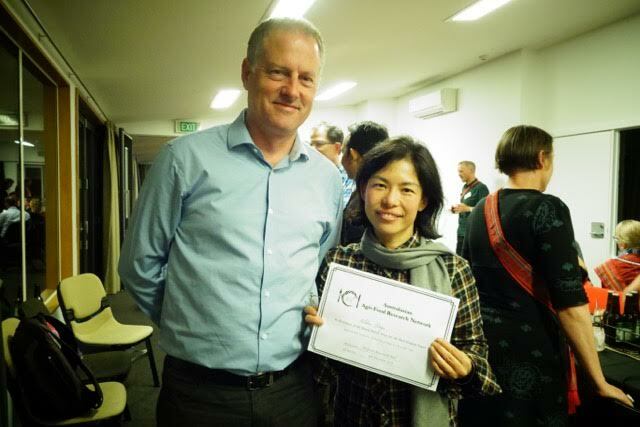 The Palmerston North, NZ conference saw the first award of the David Burch Prize for Best Student paper. The prize was presented to Ms Kate Archdeacon, MPhil student at the University of Melbourne, by Professor Terry Marsden (key note speaker from Cardiff University, Wales). Kate’s paper explored urban agriculture in Melbourne, examining assets, barriers and strategies. With the upcoming conference The Australian Agrifood Research Network is proud to announce the annual David Burch Prize for Best Student Paper. The prize of $200 and a certificate will be awarded to the student judged to have delivered the most outstanding paper in terms of the contribution to knowledge in social scientific agrifood studies. The competition is open to all graduate students presenting an unpublished paper, at the conference, primarily prepared by them. As one of the early co-founders of the Australasian Agrifood Research Network 20 years ago, and its convenor for the first 10 years, Emeritus Professor David Burch has been a key figure in building the network. He is associated with developments that have raised the profile of the Agrifood network – including mentorship, facilitating a program of publications from network meetings and not least, instituting the well-known Agrifood Trivia Night. Professor Burch has had a long and fruitful career in agrifood studies. In 1980, he earned a PhD from Sussex University in the UK for his work on the Green Revolution in Sri Lanka. He later worked at the School of Biomedical and Physical Sciences, Griffith University, Australia for 33 years until his official retirement in 2009 when he was awarded the title of Emeritus Professor. Following his retirement, he joined The University of Queensland as an Honorary Professor, where he continued his work on power in food supply chains and the financialisation of agriculture. The key focus in much of his work has been on the inequities in food distribution, particularly the ways in which patterns of income distribution, technological development and urban consumption has impacted on the rural poor of less developed countries, usually resulting in their lack of access to food – even where food is plentiful. Throughout his academic career, David has put others before himself, giving students as much as he could, and inspiring them to become the next generation of critically engaged scholars. In the last 10 years alone, David has supervised over 20 PhD students, and mentored, supported and influenced many more through his kind and approachable manner, depth of knowledge of his field and commitment to building and promoting agrifood studies. Such a gift amongst academics is rare to find, and David has it in spades. Up until 2010, he had never missed a meeting, but has been absent in 2011 and 2012 due to ill-health. Students, friends and colleagues have missed his intellectual input, and his gentle humour. Commencing in 2012, the Australasian Agrifood Research Network will honour Emeritus Professor David Burch’s contribution to agrifood scholarship by offering an annual David Burch Prize for Best Student Paper. The prize of $200 and a certificate will be awarded to the student judged to have delivered the most outstanding paper in terms of the contribution to knowledge in social scientific agrifood studies. The competition is open to all graduate students presenting an unpublished paper primarily prepared by them. Co-authored work is accepted where the student is the presenter and primary author. As judging will be based on the oral presentation, a written paper is not required. Students matching these criteria will be automatically entered into the competition at Agrifood conferences.